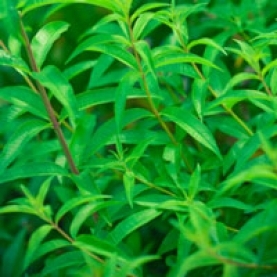 Lemon verbena essential oil is indicated for nervous conditions that often result in digestive problems. For cramps, indigestion, flatulence, dyspepsia & liver congestion. The tea is used to help restore the liver after a night of drinking, it is refreshing & uplifting. The high citral content makes this oil beneficial for the nervous system, as it helps to ease anxiety, insomnia & stress. Indicated for dizziness, hysteria, acne & Candida. A deciduous perennial shrub that grows up to 5 meters tall. It has a woody stem, pale green lanceolate leaves that are very fragrant and small pale purple flowers that grow in terminal clusters and bloom in August. The aroma has inspired writers to in an effort to capture its essence, both crisp and relaxing at the same time. Due to its strong aroma, lemon verbena is used in perfumery, as well as a flavoring in baking, jelly making and preserving. The flavor has been compared to combination of licorice and camphor. It is widely used as an herbal flavoring to replace oregano, particularly in fish and poultry dishes. Lemon Verbena essential oil brings the energy of a fresh, new day, full of promise & possibility. Helps to overcome apathy, and live more fully in the present. Assists us in accessing our higher self and creates a harmonization between body & spirit. Uplifting when depression sets in. Drug interaction, teratogenicity, skin sensitization, may be mildly phototoxic. May interfere with diabetes medication. Use caution on hypersensitive, diseased or damaged skin. Lippia citriodora is restricted by IFRA because of its skin sensitization in some people.